Activity: As part of Naturally Healthy Month Picnic in the Park is all about having fun outdoors, relaxing and trying out something new! Bring yourself a Picnic, listen to live music and soak up the great atmosphere. Activities being offered are FREE (for adults and children) and will include* sessions such as pilates, orienteering and yoga. Its all about using nature and outdoors to enjoy life, meet new people and learn new skills. You’re welcome to pop along for part of the day or all day! We are proud to say this event is a dementia friendly event. 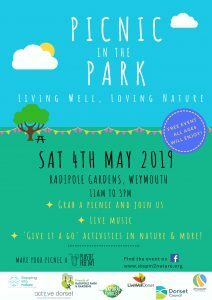 This event is free and is being delivered by Friends of Radipole Gardens, Natural Choices, LiveWell, Stepping into Nature, Weymouth Town Council, Dorset Council, and Active Dorset. If you need more information comment below or email radipoleparkandgardensfriends@gmail.com. * Activity sessions will be confirmed closer the date – please return for the schedule.